There are a couple episodes in every season that are pretty much pointless and silly. Maybe a minor plot element is resolved, like Joe and Sora getting turning around, but episodes like these you have to turn off your brain and try not to delve too deeply into them. Unfortunately, this project is about delving into every episode, so we'll have to try to muscle through this with a straight face. It's sure hard to watch with a straight face, however. There's a lot of ridiculous in this one. Let's recap: we have Devimon's attempt at recapping the events leading up to the episode, Ogremon sailing through the ocean in a sealed (but presumably not air-tight) crate, Sora managing to reel in Joe and Gomamon with a makeshift fishing pole, Joe's impersonation of a leader, Gomamon and Biyomon escaping their cell, Joe and Sora arguing while being chained to a slab, and Joe forcing Sora to help with his mantra. The important thing is that it doesn't involve throwing crap. While there's plenty of things that are groan-worthy, it still doesn't make the episode painful to watch. I caught myself shaking my head several times in the episode, but usually with a grin. It isn't up there with the later episodes filled with drama, action and plot, but damned if it's not a fun watch. There are even a few important character notes. First off, Gomamon has a serious side! When his marching fishes appear to be making process against Ogremon, his speech about the small and meek uniting to fight the big and powerful is played completely straight and is actually inspiring... at least until Ogremon repels them in one blow. After saving Joe with Sora's lifeline, Gomamon is completely serious in believing that Joe needs an infusion of confidence and asks Sora to let him lead the team. And Sora says yes! She clearly has absolutely no faith in Joe's leadership skills, second-guessing him and making snide comments behind his back. Also, she is fully capable and willing to take charge herself. Yet she sits back, plays the part of the subservient girl and lets him wear the goggles. For someone who's never been all that keen on honoring traditional gender roles (yet), it's startling that Sora would play follower just to support a teammate. Even when it seems likely to get them all killed. Joe, of course, has no clue what he's doing and tries to put on a good show as leader. His is a very unnatural bravado, but it clearly does exist. He just needs someone or something to put him up to it once in a while. In that regard, Gomamon's therapy worked... even when it does almost get them all killed. The Bakemon debacle is silly and amusing and doesn't need dwelling on. It is what it is. The important thing is that it generates a number of fun character moments and gets us two kids closer to a confrontation with Devimon. Six down, one to go! 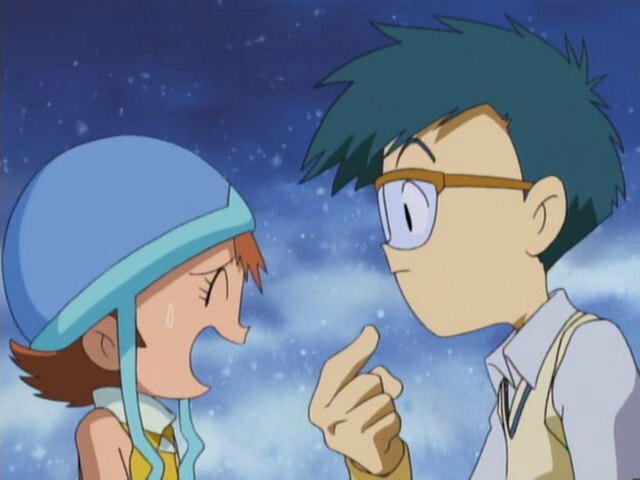 While Matt and Tentomon freaked out over finding everybody else, Sora stays calm and goes fishing for some much-needed food (and personal time) for herself and Biyomon. Biyomon's annoying singing probably sabotages that effort. Nice to see the old anime bit with the bubble representing a sleeping Bakemon. Nicer to see Gomamon aim for it to wake him up. Although Bakemon's bananas look pretty nasty. Sora's floppy hat makes a really good, hollow sound when beaten. Excellent acoustics on that sucker. This could mark the first time one of the kids actually killed a Digimon. I say could since it's unconfirmed if Bakemon was actually killed... or even if something incorporeal like Bakemon could be killed. Either way, defeating Bakemon seemed to be what took care of the dark gears on that island... which makes no sense. I like how Sora talks to the digimon as peers instead of second-class citizens. 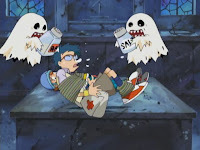 Anyway, I always assumed this episode was so strange because it was the "spooky" Halloween episode. Now this one is my favorite in the File Island arc, though the arc's finale comes pretty close too. I love how it takes Joe, ramps up his anxiety, fear, and neurosis, then sets him up in a lead position where he tries too hard to be brave and cool only to somehow end up in a situation that allows him to be TRULY brave and cool. As a fan of Sora too, I enjoy all of her moments and lines in this episode - her constant exasperation and eventual bouts of panic are so fun to see. 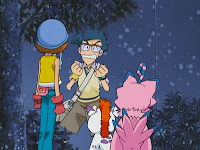 Biyomon and Gomamon also get moments to shine when they pull one over on that Bakemon guarding their prison. And after all the silly Bakemon antics, Lord Bakemon himself was surprisingly scary, and the last of three truly evil Digimon in this entire arc. The best part is how this so easily could have just been a fun little filler diversion episode before the plot got moving again, and upon first viewing it is. But they actually bring the method of weakening Bakemon back into play waaaay later on and I LOVE that! And while I agree that the dub for this one had some great funny lines, some things bugged me. 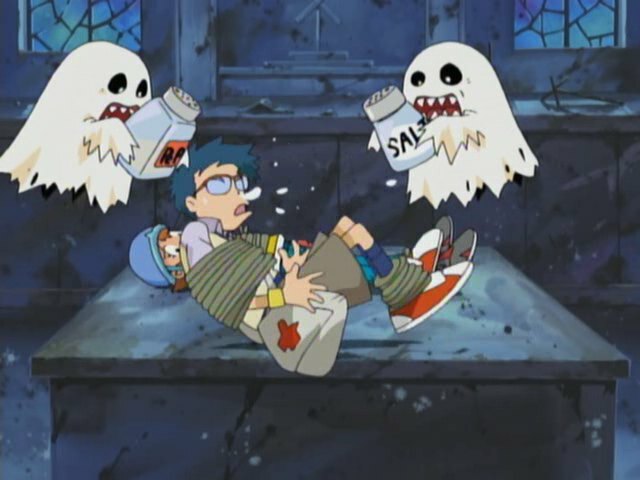 Mainly the constant Halloween references even though it was obviously a religious festivity, and the way they seemed to treat all the Bakemon as though they were just real ghosts while Bakemon was just what they all formed into at the end.